The diets of the common people were rather simple in both realms. Feasts of the rich and powerful were another matter. 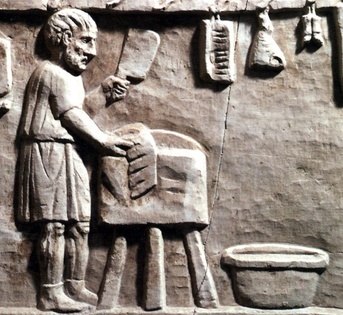 Textual descriptions aside, we can see the great variety of food items depicted in market or kitchen scenes. 1. A Roman woman shop keeper. Scene of shopping in a meat shop. Poultry, rabbit, and pig are hanging for sale. (Torlonia Museum, Rome). 2. A busy Chinese kitchen. 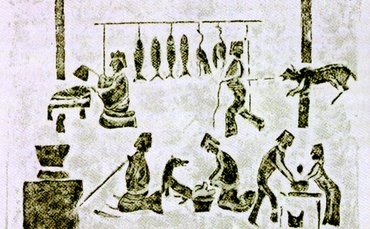 A kitchen scene showing fish and poultry hanging on a rack, while an animal is being led in to be slaughtered. Cooks are chopping meat, stoking the stove, and kneading dough. (Chendgu, Sichuan). A butcher. 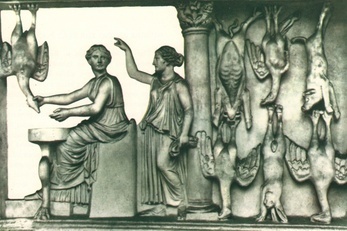 Detail of a second-century base-relief in Ostia. A fish monger. 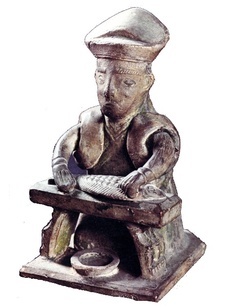 Pottery model from a Latter Han tomb. 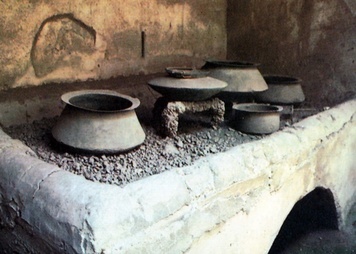 Bronze pots and pans on a kitchen hearth. Pompeii. Pottery stove. Former Han burial object unearth in Guangzhou, south China. 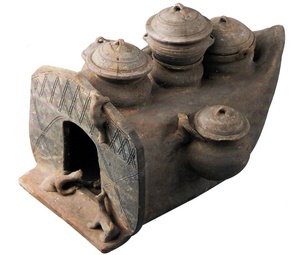 Stoves excavated from other parts of China have different shapes. The Romans dined reclined. Some dining rooms had built-in inclined platforms for the purpose. Food were placed on light tables in front of the couch. 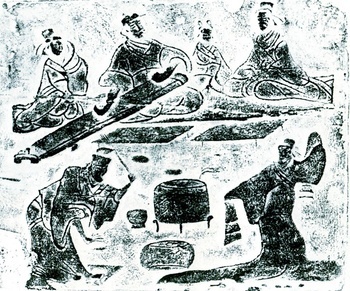 Before the importation of chairs around the sixth century, the Chinese dined sitting on mates. Food were brought in on trays with short legs. 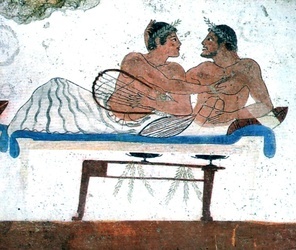 Detail of a painted plaster showing a symposium scene, from a tomb in Paestum, south of Naples. Fifth century BCE. (Museo Archeologico Nationale, Paestum). 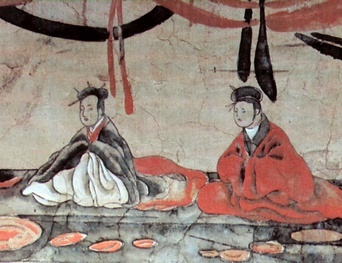 Detail of a Latter Han tomb mural showing the host and hostess in a banquet. (Luoyang Museum). Courtesans and wine were common in Roman parties. 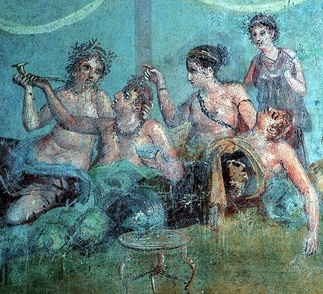 Detail of a mural in Pompeii. Wine was drunk from cups of all shapes and various materials. 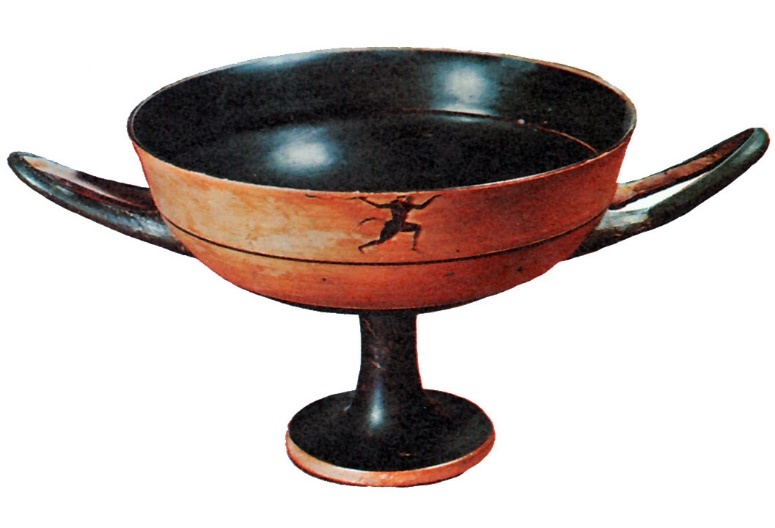 Adaptions of the Greek kylix and Persian rhyton often appear in Roman paintings of banquets, as the two shown above. The rhyton serves as both a pourer and a cup. Filled via the funnel, it lets out the liquid through a hole in the front. Bronze tripods called jue were popular in pre-imperial times, but seemed to pass with the feudalistic aristocracy.